The Annis and George Bills horse trough at the Blacksmith’s Cottage is a survivor of a series of troughs donated by the estate of Annis and George Bills. 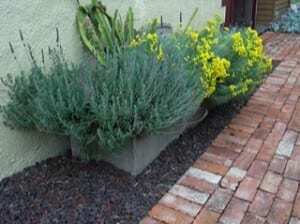 There are two Bills troughs in Bacchus Marsh, one outside the hotel on the corner of Young and Main Streets and the one in the side garden of the Cottage. This was moved to the grounds of the cottage from Racecourse reserve in 2000. Both troughs are now used as flower beds. The trough at the cottage is planted with geraniums, lavendar, epiphyllum and santolina. The Bills trough is located in the garden at the side of the cottage and is easily visible from the street. The Blacksmith’s Cottage is open to visitors on a regular basis. Please see the calendar of events for opening dates, times and themes. Entry is FREE.